Benefits of pre-employment background screening and of conducting background check throughout individuals' employment tenure cannot be turned a blind eye. Dangers of hiring and on-boarding employees with fudged education certificates, tampered salary slips are self-evident. Dangers increase exponentially when risks are also about on-boarding employees who indulge in substance abuse or have a criminal history, or fall in bad books of colleagues and reporting managers. 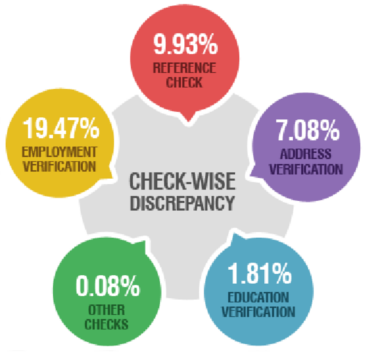 Consolidating the above check-wise discrepancy trends help in concluding that almost 17.82% of all employees screened come out as discrepant. Candidates can be screened pre-hire, pre-offer, pre-joining, post-offer or post-joining. Experts of the industry vouch that outsourcing these processes to background verification companies is a safer and securer way of ensuring that the workforce you hire is trust worthy, is compliant and does not come with any legal, criminal or terrorist history or links. Seven Consultancy is one of the leading Background Check Company in India. Our in-depth knowledge of the background screening process and wide reach across industry sectors makes Seven Consultancy your best partner for employee background check With focus on innovation, Seven Consultancy functions on a smart technology solution which makes the end-to-end process error-proof and speed-oriented. Employee Background Verification Services comprises of the following checks. Background Verification is one of our strong division of HR Consultancy in Mumbai, Navi Mumbai & Thane. We are helping our clients to be a reliable Background Verification Agency in Mumbai, Navi Mumbai & Thane for more than a decade. We are known as leading complete Background Verification Company in Mumbai.